The Golden Square Mile (Le Mille Carré Doré) is located at the foot of Mount Royal. It’s a small neighbourhood built between 1850 and 1930. The Lady Meredith mansion was originally named Ardvarna and was completed in 1897. The house was originally part of the Simon McTavish estate which was sold off by his heirs. Andrew Allan a wealthy ship-owner and financier purchased a parcel of this land and gave it to his daughter Isabella Brenda Allan and her husband Sir Vincent Meredith in 1888. In 1894, the Meredith’s hired architects Edward & William Sutherland Maxwell to build their home. The turret mansion was built with red brick, sandstone, terra cotta and a black slate roof. The façade reveals multitude of architectural influences both Queen Anne revival and Richardsonian Romanesque. The Meredith family was generous philanthropists. Vincent Meredith, the 14th President of the Bank of Montreal set up the Sir Vincent Meredith Fund which provided financial relief to female employees. This fund still exists today at BMO and now helps employees and pensioners in financial hardship. In 1918, following the First World War, Lady Meredith set up a rehabilitation Centre for the wounded Canadian soldiers in her home. When Sir Vincent Meredith died in 1929, he left six hundred thousand dollars to the Royal Victoria Hospital, McGill University and Bishop University. In 1941, Lady Meredith gave the mansion to the Royal Victoria Hospital where it was used by the nurses as a residence. 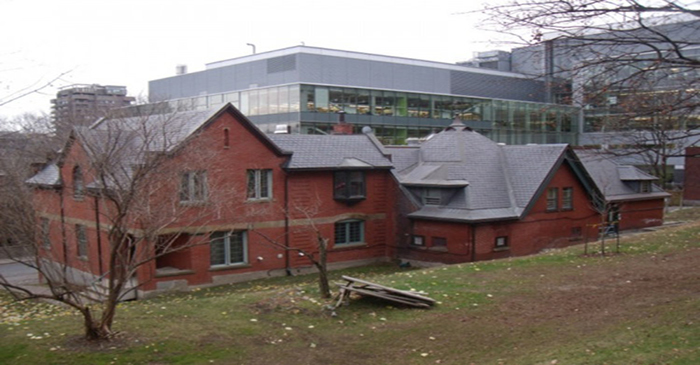 In 1975, McGill University purchased the building and formerly renamed it Lady Meredith House. An attempted arson on January 7, 1990 required a major renovation; the building was also designated as a National Historic Site of Canada on November 16, 1990. Our North Country Unfading Black, 16” x 8” x ¼” was supplied for this re-roof.